Herakut are back in Los Angeles for their upcoming show at Corey Helford Gallery. Second wall by Nychos from his latest visit to Los Angeles. You can check out this wall in Culver City at Graphaids. New piece by Nychos in Downtown Los Angeles at The Container Yard. Day 06 at Pow! Wow! Long Beach. Day 03 at Pow! Wow! Long Beach. Progress at Pow! Wow! Long Beach. Pow! Wow! lands in Long Beach and a handful of new murals are now going up. Artist include James Jean, Low Bros,Jeff McMillan, Nychos, Fafi, Cryptik, Hueman, Benjie Escobar, Madsteez, Tristan Eaton, Aaron DeLa Cruz,Push, Jeff Soto and Bumblebee. 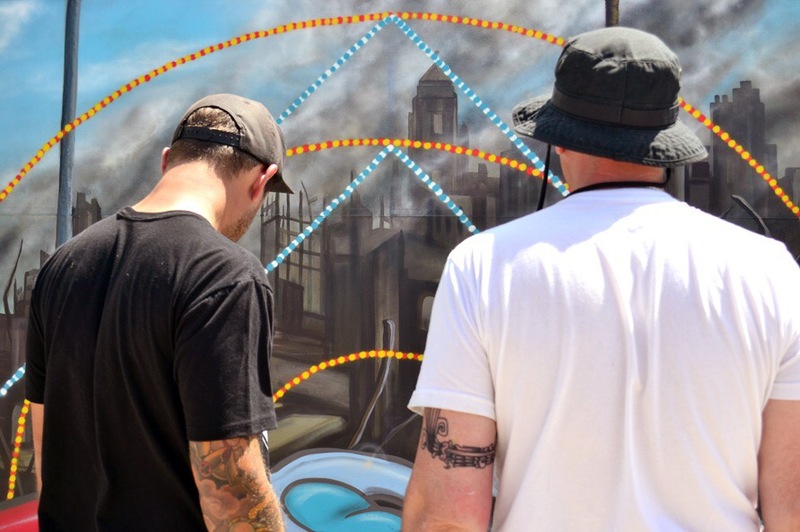 New mural collaboration by MDMN and Clinton Bopp in Abbot Kinney. Spanish artist Dourone completed his latest mural in Playa Vista before heading back to France. New mural by Spanish artist Dourone in downtown Los Angeles. Curated by Do Art Foundation. Studio visit with Jennifer Korsen for her upcoming show “Cross My Heart” at Stone Malone Gallery.